Oi-otoshi (追い落とし, chasing and capturing, or, perhaps better given as, chasing down), a Japanese go term, describes a situation where a stone or group of stones is put into atari in such a way that there is no escape. This occurs usually when the only way to save such a group temporarily is to connect, and that the resulting group is still in atari. Hence the related English terminology, connect-and-die, and the Chinese 接不归 (jie1 bu4 gui1) (unable to connect back). Oiotoshi is also known under the terms connect and die and serial atari. After , the three marked stones are under atari. 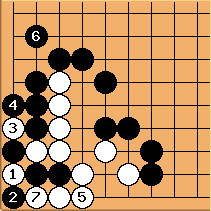 However, if black tries to save the three stones by connecting with a, then white captures everything with b. Hence, the three marked stones are effectively captured and we say that these stones are caught in a connect and die. The three Black stones are captured in connect-and-die. After throwing in twice with and , White ensures life by connecting at . Black can not save all his stones. spazdor: I would like to propose another name for this: "catching the lizard by its tail." Some types of lizards, when caught by their tails, will allow the tail to fall off so that they may escape, leaving the wriggling tail behind to confuse predators. Shortage of liberties and throw-in. The Crane's Nest is a classic example of oiotoshi. Note that Oiotoshi is also a form of auto-atari: while one group is already in atari, the connection will place new stones in atari. Gokyo Shumyo Tsumego Series, section 5 has 40 oiotoshi problems.